In celebration of GLBTQ Pride Month, the Independence Library, 18 South 7th Street, will host a casual dessert and coffee social on Friday, June 28 from 3:00 to 5:00 p.m. Our library is the home of the Barbara Gittings GLBTQ Collection, the largest GLBTQ public library collection east of San Francisco. Refreshments for our meet-and-greet will be provided by the generous Friends of the Independence Branch. For more information, call 215-685-1633 or e-mail glbtlibrary@yahoo.com. For any of you who do not already know her name, Barbara Gittings was among a small, fearless group of people who demonstrated for the civil rights of the gay community during the mid-1960s at the Pentagon, the White House and Philadelphia’s Independence Hall. She fought for, among other things, an end to employment discrimination by the federal government against homosexuals, and for inclusion of gay and lesbian materials in public library collections. Barbara headed the Gay Task Force of the American Library Association for 15 years and edited its Gay Bibliography and other gay reading lists. The Barbara Gittings GLBTQ Collection was created in 2001 as a living tribute to Barbara Gittings by her friends who knew she had had a reoccurrence of cancer and wanted to honor her with a collection in her name while she was still alive to see it. Barbara and her life partner, the photojournalist Kay Tobin Lahusen, were at the branch for the collection’s dedication. Barbara died in 2007, but the collection continues as a living tribute to her memory and her achievements. Many volumes from the collection were destroyed when the ceiling sprinklers were triggered by a building renovation, and many GLBTQ movies were lent out to other branches and never returned. However, the Free Library has renewed its commitment to the collection, allowing it to remain in place at the Independence Library, and purchasing replacement books and videos. The Friends of the Independence Branch are also generous donors, purchasing new materials including recent purchases of GLBTQ graphic novels. 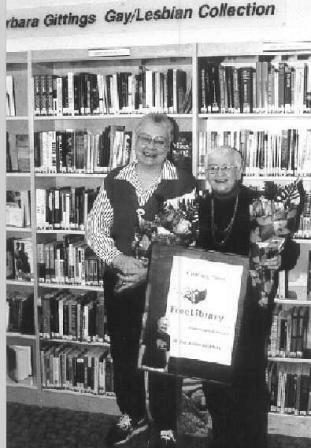 The Barbara Gittings GLBTQ Collection serves our local community, but also fills interlibrary loan requests from people throughout Pennsylvania and the U.S. If you have never browsed the Barbara Gittings GLBTQ Collection, why not stop by? We have a circulating collection of popular queer movies, mysteries, romances, science fiction, fantasy, and general fiction books, with many nonfiction choices as well. A special note: 2015 is the 50th Anniversary of the first Reminder Day Demonstration at Independence Hall. From 1965 to 1969, a small group of visionary pioneers stepped forward each July 4th to picket, carrying signs that called for equality and fair treatment for homosexuals. These demonstrations were the first sustained national effort to focus public attention on the discrimination faced by gay people and encouraged GLBTQ Americans to organize for equality. These demonstrations are commemorated by an official Pennsylvania historical marker at 6th and Chestnut Streets. Philadelphians Barbara Gittings and Kay Lahusen were among the demonstration organizers.